Well, quince. You wouldn't call it a 'typical' fruit, autumnal or otherwise, not in Japan at least. In fact, I suspect many people don't know much about it here, and most have probably never seen it. It is, however, a fairly common fruit here in this part of Nagano where they have been growing quince since the old days. You see trees here and there, and the fruit makes its appearance at green markets and supermarkets in mid to late October. It is called marumero in Japanese, which originates from the word in Portuguese, marmelo. Incidentally, there is this other fruit that looks (and is) very similar to quince, called karin in Japanese (Chinese quince), which is also common here in Nagano. marumero and karin - which is which? There is a great deal of confusion about these two fruits around here, and they often get mixed up with one another, even at the market. One simple and easy way to tell them apart is by the 'fur' - quinces are covered with grayish fur, while karin aren't. My folks here used to have a quince (not karin) tree at the edge of one of their apple orchards. I had a chance to pick the fruits a few years ago (these pictures come from 2008). But the tree died last year or maybe the year before, and does not bear fruits any longer, which is a shame. 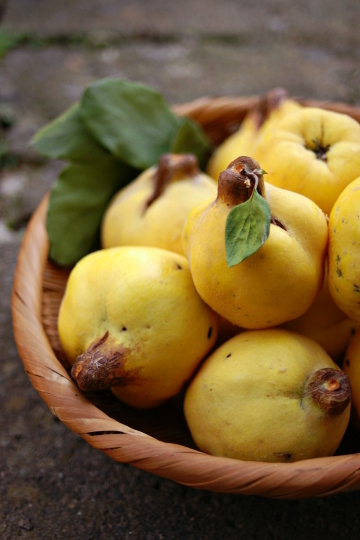 But at least I can still get my hand on quinces at the market, so not everything is lost - as long as I don't miss its short season from late October to mid November. 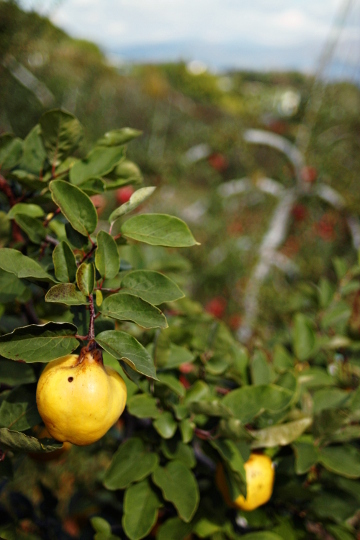 For a fruit that has been fairly common in the area, quince seems to find its way into surprisingly few things. 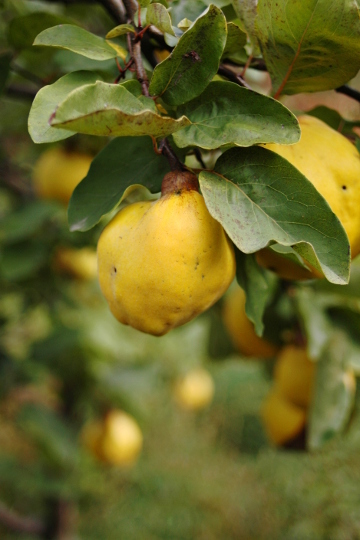 Inedible raw, quince must be cooked or 'treated' in one way or another to be suitable for eating. 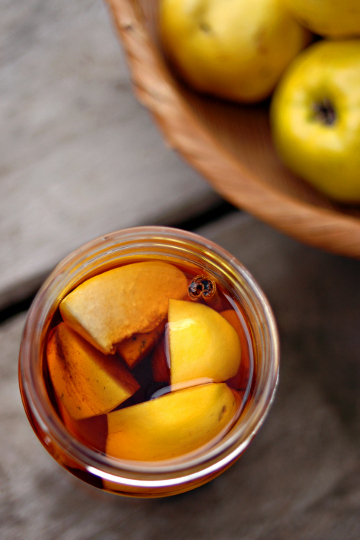 One of the most common use may be to steep the fruit in grain alcohol to make quince liqueur. Quince jam may also be common, although I use the term 'common' in a relative sense (as in, you just don't see much other quince products). My mother often makes honeyed quince (or karin) by soaking thinly sliced and quickly blanched quinces in honey; the quince-infused honey not only tastes and smells wonderful but also is great to sooth sore throat in dry Japanese winter. 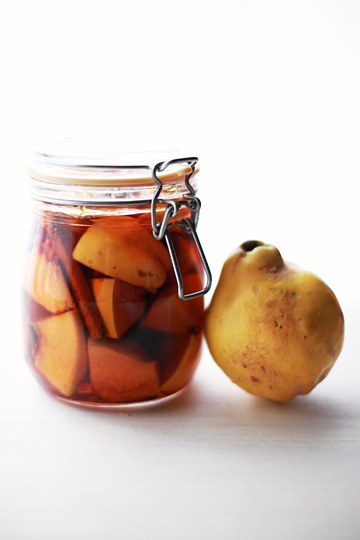 As for me, well, I like to make quince brandy; after all, I'm known to throw any fruit into a jar of alcohol for homemade liqueur. This is a batch of quince brandy I prepared last fall, using Nigella Lawson's recipe in her book How to Be a Domestic Goddess: Baking and the Art of Comfort Cooking (Hyperion, 2001)(US edition). You just throw cleaned quinces, cut into large chunks, into a jar with some cheap brandy along with cinnamon and star anise, though I used cardamom pods in place of anise, which I never care for. And oh, I made two batches - prepared in the same way, except one had marumero and the other, karin. I found it interesting that this recipe does not call for sugar, when most homemade fruit liqueurs do, and they use it a lot. Nigella says it's ready in six weeks, but I put mine in a dark corner of the liqueur shelf and pretty much forgot about them until recently. So they're one year old. If it was difficult to tell my two batches apart when they were prepared, it is close to impossible now they've spent a year and the fruits turned dull brown and lost any bit of distinctiveness. The one pictured in a small glass is the marumero liqueur, but the two looked pretty much the same. They tasted rather different, though; marumero liqueur was a touch mellower and that won us over. We were also pleasantly surprised to find that the liqueurs tasted fairly mild despite the lack of sugar in the preparations. We'll be definitely making it again. 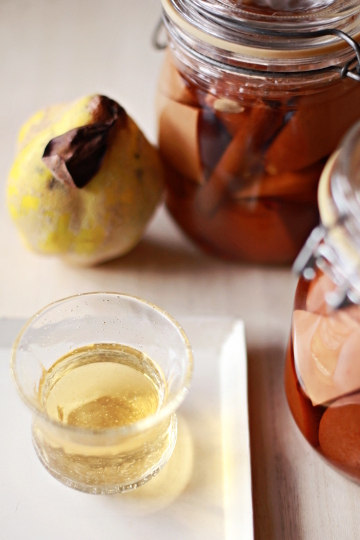 Now, homemade liqueur making has been pretty much the extent of my doing anything with fresh quince, until this fall. Yes, I'd pick fruits from the tree or buy a bagful from the market, and I'd even make a point of searching for quince recipes on the Internet or in my cookbooks - but I have to admit that I never really got around doing much with them. I may have baked a quince-apple crumble a few years ago, but that was pretty much it. I suspect it may have something to do with the fact that quince need to be cooked for it to be edible, and it need to be cooked for a long time. Have I ever told you how lazy a baker I am? But this year, I decided that it needed to change. I'm a still lazy baker, yes, that bit remains the same, but something moved me into actually cook quince and make something with it. 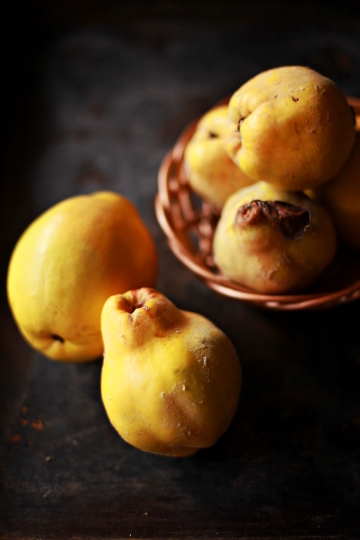 And once I did so, I was delighted to find that it is rather exhilarating to cook with quince. The cutting and slicing the rock-hard fruit can be a bit of fuss, yes, but the intoxicating scent of the fruit that perfumes the room as you cut them and cook them is quite something. It's really worth the trouble just for the smell. The simplest thing I did with my quince was this: roasting. 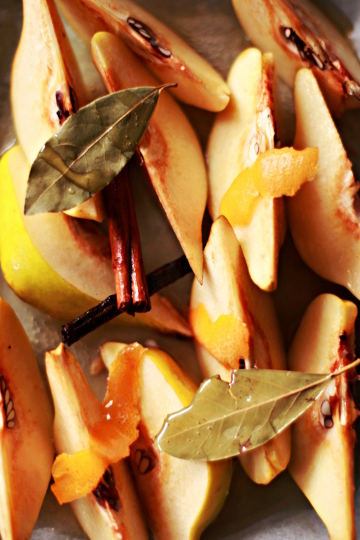 Oven-baked quince with spice and honey, that is. I used the recipe in A Year in My Kitchen (Quadrille Publishing, 2006) by Skye Gyngell, which you can also find here, although the recipe is a bit different from the one in the book (I assume you don't need the salt and pepper, and you do need to use a bit more honey). I ended up deviating from the recipe, and the biggest difference was that I didn't use verjuice for I can't find it here. The recipe suggests that you use apple juice and a bit of lemon juice as a substitute for verjuice, and I used (hard) apple cider and lemon juice. I also ended up using a lot of it than it is called for in the recipe as the liquid kept drying up during cooking. It smelled lovely in the oven, but I seemed to have overbaked them or otherwise messed up as the fruits turned out tough and chewy. Although I can hardly say I've done justice to roasted quince, I think I may prefer my quince stewed rather than baked. Like pancakes. When I was looking for quince recipes earlier this month, a link to this recipe showed up in my twitter feed, and I was making the puree the following day. 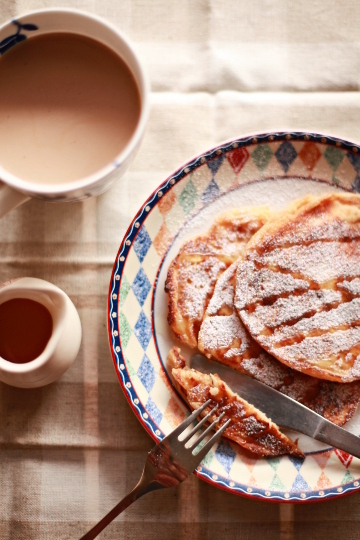 Quince pancakes - doesn't that sound just so good? 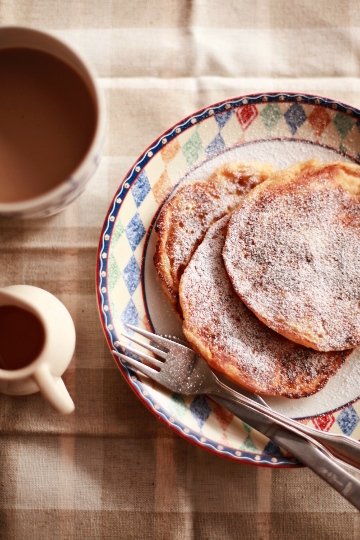 My plan was to prepare quince puree in the evening, and whip up the pancake batter on the following morning so I could have fresh, warm pancakes for breakfast. But it so happens that I ended up making the pancakes two days after I'd prepared the puree, but they turned out just fine. Well, after a few disastrous pancake-like messes, that is. (You know, I am forever pancake-making novice.) But good news is that they looked just fine dusted with confectioner's sugar, and that they tasted really good. I made my puree slightly chunky, so the pancakes were dotted with quince bits; not that you can taste the fruit a lot, but they certainly smelled (and tasted) sweet. I liked them with a drizzle of honey. And as I was making quince puree for the pancakes, it occurred to me that this was more or less like applesause - except it was made using quinces rather than apples, obviously. So I decided to make a larger batch of quince puree and use the leftover to bake something, using it in lieu of applesause. 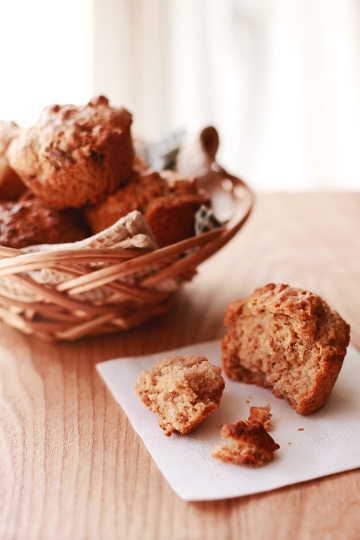 I used a simple recipe for applesauce muffins, and replaced the applesauce with my quince puree. To my delight, my plan worked out really well (for once!) 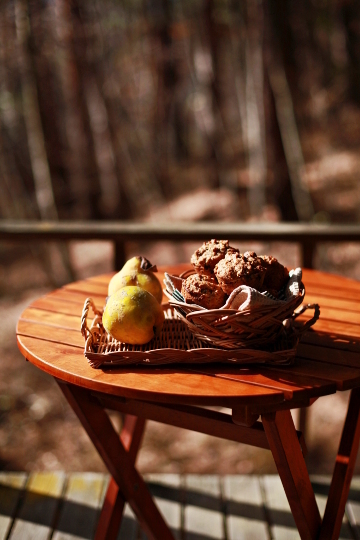 - the quince puree fit in beautifully, and my quince muffins came out wonderfully. 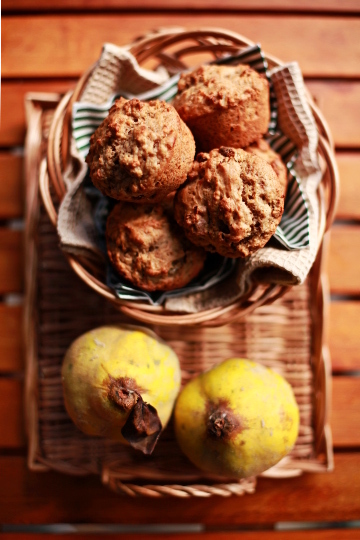 Again, you wouldn't taste much of quince in these muffins. Then again, I'm not sure if I can really tell exactly what quince tastes like; to me, it's more about the sweet scent than anything else. That said, stewed quinces do taste good, and make an excellent mix-in, as they did in this pound cake. 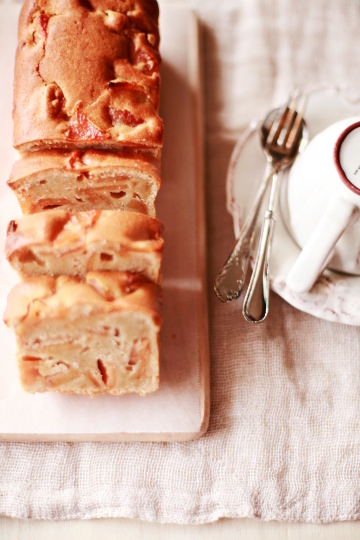 This lightly spiced quince pound cake was something I'd meant to make for some time, and I'm glad I finally did. 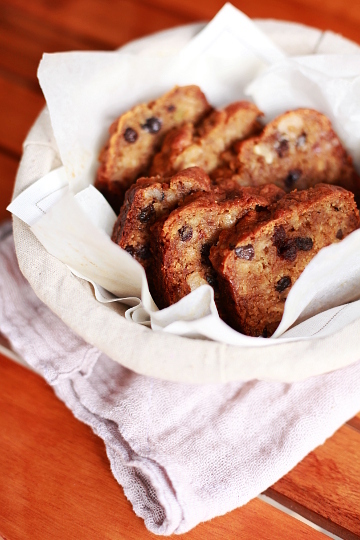 The recipe got a lot of rave reviews, and it did produce a cake that tasted lovely. However, I couldn't help but notice that it doesn't use any leavening agent (such as baking powder), and doesn't even tell you to whip your eggs, which also helps the cake rise. Since the cake came out a bit dense, I'm thinking I might add a bit of baking powder next time I make this cake - oh yes, I stewed more quince than I needed for my batch of cake, so I can bake it again. 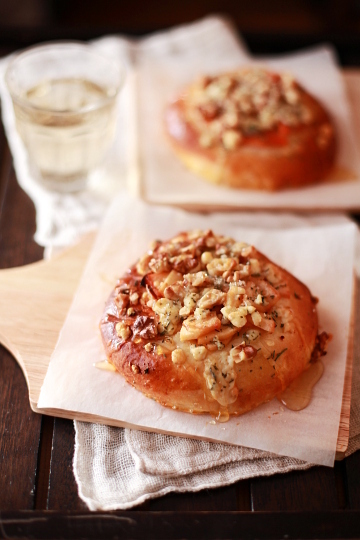 How about sweet and savory buns? Their proper (and more dignified) name is brioche tarts with blue cheese, walnuts and quince; it's a recipe by Charlie Trotter which I first found in this book, but apparently it first appeared in The New York Times in 2001 and can be found online here. 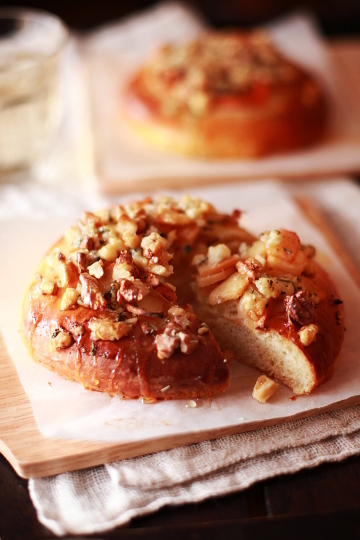 As far as recipe goes, what it's called is what you get; these are 'tarts' based on brioche dough, topped with sauteed quince, chopped walnuts, and crumbled blue cheese. 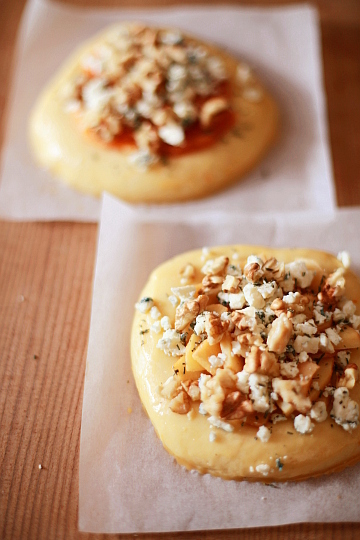 It also uses rosemary added to the dough and as a topping. A quick look at the list of ingredients and I knew I'd like them. And a quick look at the list of ingredients also made me do a double take at the amount of butter required. If you follow the recipe, you'll use over ten ounces of butter just to make four servings (i.e. four tarts). Now I wasn't at all into the idea of making (and eating) something that's got over half a stick of butter (or over 70 grams) per serving, so I took the liberty of cutting the amount of butter in half for the dough. I also made only a half of the recipe as I often do with non-Japanese baking recipes (we have small ovens, folks), but made four tarts nonetheless. This should have made smaller tarts than those described in the original recipe, but I somehow ended up with four tarts that were about as big as what the recipe says. And they weren't that flat - which is why I'd call them 'buns' rather than 'tarts'. And oh, I forgot to dust the tarts with sugar before putting them into the oven (typical...), so I sprinkled them with some sugar halfway through baking. Not quite the same, I know, but hey ho. These small-ish issues aside, they turned out great and went down well. (But one tart still made more than one serving, I think.) Again, I enjoyed them with a drizzle of honey. By the by, the recipe suggests that you use "quince, pear, apple or persimmon", and since I had all of them, I decided to use all of them; one tart topped with quince, one with apple, one with persimmon, and one with all of the three (reads: leftovers from the other three tarts). They were all fine, but I think I liked the apple one the best; quince, I didn't taste it much again, and persimmon, I never liked them in the first place. It isn't among my most favorite fruits, to put it nicely. More frankly, it's one of my least favorites. I have always been an avid fruit eater since I was a kid, but three things never appealed to me: fig, apricot, and persimmon. As I grew up, I became fond of figs and now it's one of my solid favorites. Apricots, I still don't like them, but I've been experimenting with them for the past few years, and now I've learned to enjoy them as long as they're cooked. But persimmons? Not really. I've never even cared to give them a try but have pretty much ignored the whole existence of the fruit. 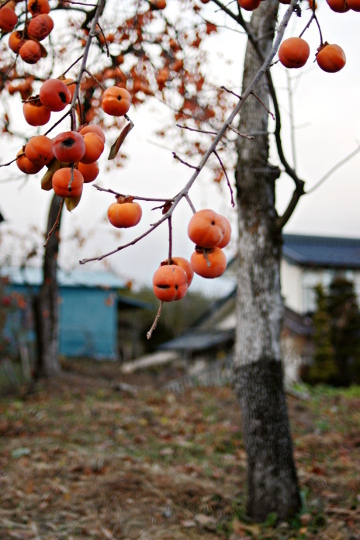 Sure, the trees laden heavily with the bright orange orbs may be a quintessential view of late autumn in Japan (or maybe anywhere), but I've never so much as stopped and take a look at them, trees or fruits, even though they are practically everywhere. And yet, because they are practically everywhere, it seems almost inevitable that some will find their way into your house, usually from someone with a persimmon tree in their front yard - and that was what happened to us a few weeks ago. ...why, more persimmons. The amazing (or disturbing) thing is that it was I that bought them; yes, I paid by my own choice to take possession of something I don't even like, when I was supposed to be trying to free myself from the burden of what I already had. It doesn't make sense. But I just couldn't resist these - small red persimmons sold still attached to branches when I saw them at a local green market. They were just too adorable! I know I've ignored them when they were all attached to the branches on the tree, but let's not fuss over minor details here, shall we? As a matter of fact, I did have some ideas as to what to do with the persimmons: turn them into some cakes. Several years ago when I was in Hawaii, our landlord once brought us a bag of persimmons which we were too polite to turn down, and that was when I found a recipe for persimmon cake. I tried it, and was pleased to find that the cake was pretty decent. In fact, the cake didn't taste of persimmon at all, which was probably why I liked it. So I was secretly game for another stab at baking with a few persimmons. And as I started searching for persimmon recipes, I realized something: not all persimmons are created equal. I mean, I did know there are few different varieties, but like I said, I had never paid much attention to the fruit on the whole. 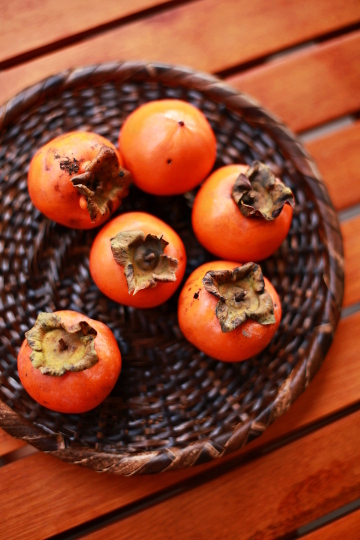 Now in Japan, persimmons are divided into roughly two categories: shibugaki and amagaki, or bitter and sweet persimmons, respectively. Shibugaki are extremely astringent and inedible raw unless they are completely ripe, in which case they are really sweet and jammy. Amagaki, meanwhile, are a sweet and crunchy kind that do not need to be overripe before they can be eaten. You may be more familiar with such varieties as hachiya and fuyu; hachiya is a typical shibugaki, and fuyu, an amagaki. 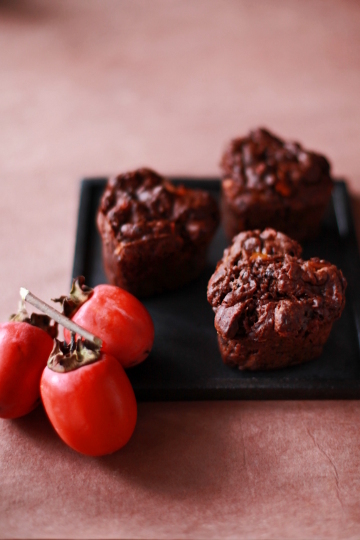 Chocolate persimmon muffins! There are few things that cannot be improved by chocolate, isn't that right? It is a recipe by Kim Boyce, found in her book Good to the Grain: Baking with Whole-Grain Flours (Stewart, Tabori & Chang, 2010). They've got a lot of chunky persimmon puree and chopped chocolate in the batter, and happen to use a lot of buckwheat flour. 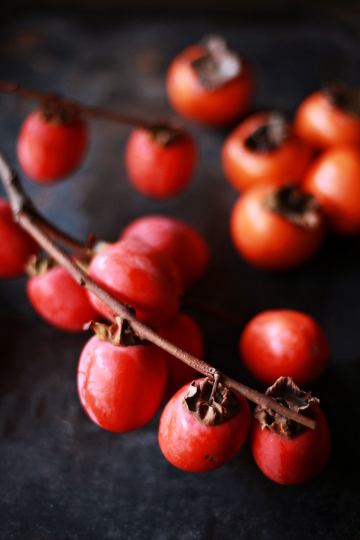 Then again, they didn't taste much of persimmon (or buckwheat). But they weren't just simple chocolate muffins either; very chocolate-y, moist, with a bit of robust flavor thanks to the buckwheat flour and a lot of fruity jamminess from the persimmons, just not the taste of them. And that was probably why I liked them; I didn't taste persimmon in them. And also because they were very good muffins, period. So if persimmons don't taste like persimmons when they were baked into cakes and muffins, it should make it a whole lot easier for me to get rid of a small heap of persimmons that tend to arrive at our place more often than we ask for. Cheered by this idea, I dived into a bit of persimmon-baking binge, with this deeply moist and lightly spicy spiced persimmon cake with brown sugar. 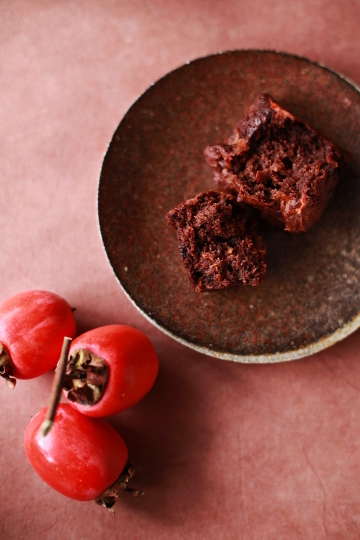 I used the very same recipe (in Japanese) for the cake I'd made with persimmons in Hawaii. Laden with grated persimmon flesh (or puree, if you like) and studded with walnuts and raisins, it turned out rather more puddingy than I remembered it had last time, but it was just tasty - and non-persimmon-y - as I remembered. Particularly good a day or two after it was baked, the cake made a great teatime treat. Because I liked the cake, I looked for another persimmon cake recipe, and found this persimmon bread, a recipe originally created by James Beard and adapted by David Lebovitz. That can't go wrong, right? And it didn't, of course. It is a breeze to make once you have pureed your persimmons and chopped your walnuts, and had a warm, wonderful flavor - but again, not of persimmons, not in a way you can tell. I used a lot less sugar than suggested in the recipe, by the way, but the cake was still very sweet and moist, thanks probably to the sweet persimmons. The curious thing is that I thought this would make something similar to the spiced persimmon cake above, judging by the list of ingredients. Both recipes use a lot of persimmon flesh, grated or pureed, in the batter. They both have spices, dried fruits, and nuts. But the first persimmon cake is made by beating butter with (brown) sugar until creamy and whipping an egg white, and using pastry flour. A classic method to make cake, except maybe for the persimmon part. This persimmon bread on the other hand is a classic, combining-dry-and-wet-mixtures recipe, like banana bread or zucchini bread. And that probably did make a difference, as the two cakes turned out very differently. 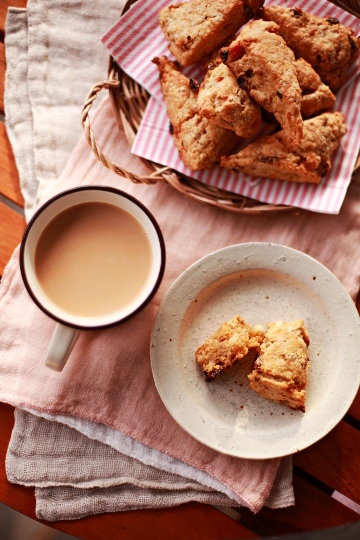 How about persimmon and white chocolate scones? After all, it'd be unlike me if I got some fruits and didn't turn them into either scones or crumbles, the two baked items that I seem to be making most often. I used this recipe (in Japanese) that I'd found after looking for a persimmon scone recipe, and I'm glad I did. 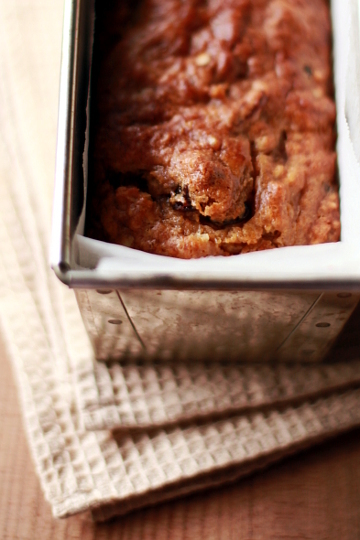 It uses pureed persimmon flesh as the wet ingredient in the dough - no milk or cream required. 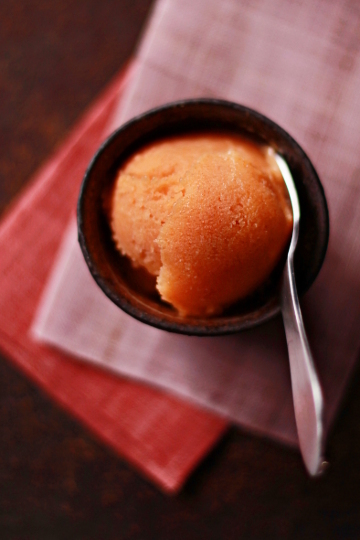 The persimmon puree also doubles as the sweetener, so you don't need to use sugar. I added some raisins as suggested in the recipe, and some chopped white chocolate - not suggested by the recipe, but on a whim. 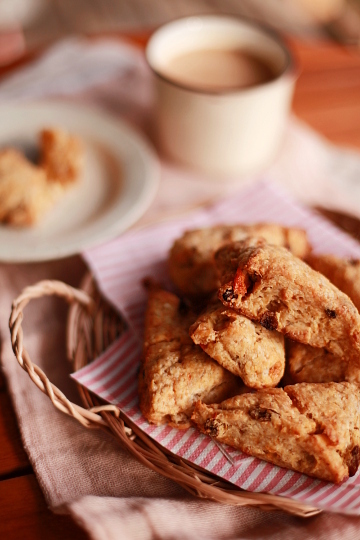 This created an excellent batch of scones, tinted in a light shade of orange with bright orange freckles here and there. You can make them completely sugar-free if you omit the white chocolate, and they'll still be good and sweet enough with the persimmons and raisins. But I think the caramelized white chocolate worked really well in these scones. And you might not need to hear this again, but no, they didn't taste like persimmon at all. Excellent. 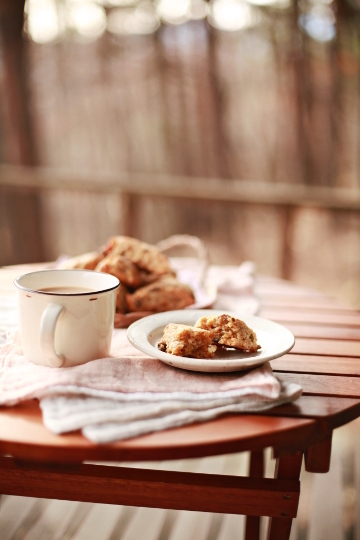 We all liked these scones very much, so I baked them again just a few days later - this time with a mixture of all-purpose and whole-wheat pastry flours, ground ginger in addition to ground cinnamon, and dried cranberries in addition to raisins. Again, very good. And you know what happens when you are doing this much of baking with persimmons? I was out of persimmons to use before I'd tried everything I wanted to try this time. I asked my folks to get me some more persimmons when they were out shopping, and they brought me two large bags of these enormous fruits. Seriously, I never knew persimmons could be this big - the ones I first got were really small, in a size and shape of an egg, while these weighed well over ten ounces each. And once again, I found myself with way more persimmons than I knew what to do with. But this time I wasn't at a loss. Now I know I can handle persimmons by baking with them - making something I can enjoy. Not any baking, though; I've tried roasting a few wedges of persimmons when I baked quince, and I didn't particularly enjoy them as they tasted like, well, persimmons. They need to be pureed and incorporated into a dough or batter, for me to be able to enjoy them. Good news is that I now know all this, and that now I have a few good recipes to turn to. I don't think I'd rush out to buy persimmons anytime soon, but I know what to do with an odd bunch of persimmons should they find their way into our place, as they are bound to be. 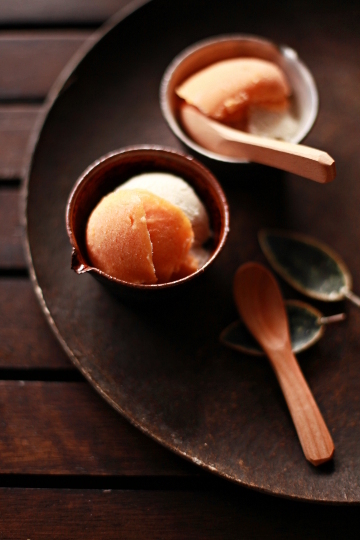 Persimmon gelato, anyone? Very orange, very sweet, and very... persimmon-y. I used this recipe (in Japanese) because it is very easy to make. It's mostly just fresh persimmons, frozen and pureed with a bit of milk and sweetener. So even before making it I knew it would taste very much like persimmon and that I wouldn't like it very much (which it did, and I didn't). Yet I still wanted to make it, because there was something I wanted to do with it. It was to pair persimmon gelato with chestnut ice cream, a combination that I'd first tried and loved in Italy a few years ago. It was November 2009 and I was in Florence, hitting some of the gelato places in town, sometimes on my own and sometimes with a friend of mine who lives there. 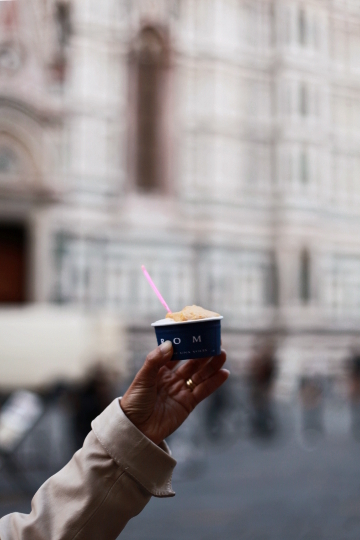 One of the places I went to with her was Grom, where they had persimmon gelato as a flavor of the month. 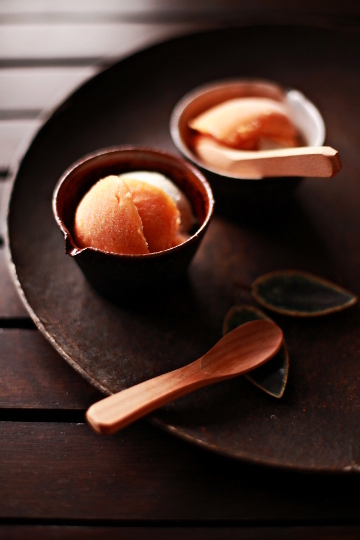 I had never heard of persimmon gelato (or ice-cream or sorbet) before, and despite my dislike of the particular fruit, I couldn't help but try it, our of pure curiosity. But I did think of the possibility that I might not enjoy it, so I also ordered candied chestnut (marron glacé) gelato as well. I just thought they seemed to go well together. gelati from grom, florence, italy, november 2009. And so they did. The persimmon flavor wasn't too strong here, but I still preferred to have it together with the chestnut gelato. This was the first time I enjoyed something persimmon-y, and I promised to myself and my friend that I'd get myself to try and recreate the combination when I'm home. It has taken me two years to put my word into practice, but here they are. I already had my go-to chestnut ice cream recipe that I made last year (and mentioned about it recently, here). My persimmon gelato tasted a lot more of the fruit than Grom's and my chestnut ice cream creamier and lighter, but they paired beautifully and I definitely loved them together. Here's how I made them, in brief, in case you're interested. Do adapt and adjust it to your taste. Wash, peel, and core a large, ripe fuyu persimmon or two. Cut them into wedges, and freeze in a bag overnight or until hard. 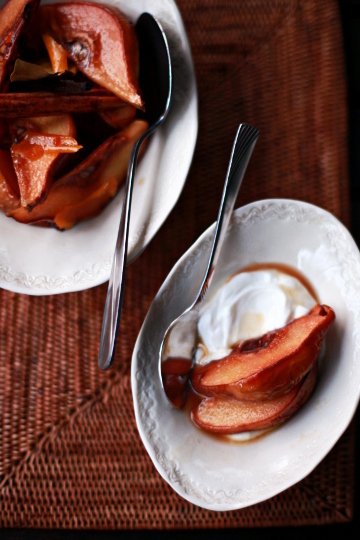 Leave the frozen persimmon wedges at room temperature for a while so they are only slightly thawed. Place the fruit in a blender or a food processor, add 1-2 Tbs. of milk and 1-2 tsp. of rum, and process until smooth. Taste, and add a little more milk if you would like your gelato milkier, and a bit of honey if you want it sweeter. Serve immediately as very soft gelato, or put the pureed mixture back into the freezer until ready to serve. Adapted from this recipe. Whip 200 ml / a little over 3/4 cup of chilled heavy cream until soft peaks form. Fold it into 120 g / a little over 4 oz. of good quality sweetened chestnut paste (preferably no added flavorings), along with 1-2 tsp. of brandy and 1-2 tsp. of milk (optional). (Alternatively, process everything together in the blender until the mixture is lightly whipped and airy.) 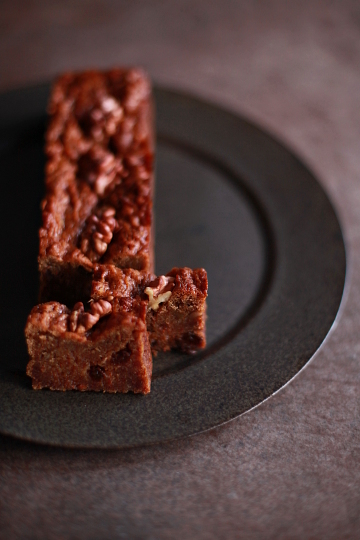 Taste, and adjust sweetness with more sugar or chestnut paste if needed. Freeze the mixture at least 4-5 hours or until scoopable. So, this was my month of experimenting with quince and persimmon. Bright yellow and deep orange, they are an epitome of autumn colors in the mountains and it was fun to bake with them. 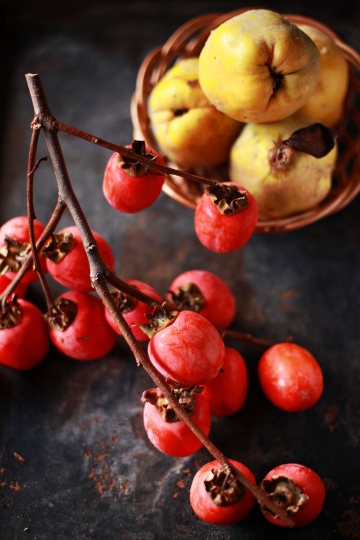 They are both important autumn fruits, but both may be a little underappreciated in some cultures and among some people. I was never really familiar with either of the two, but I'm glad I got to know a bit more about them, even if I still don't care for persimmons themselves. Quinces and persimmons have nearly disappeared around here, and it will be a year before I get to play around with them again. They aren't the fruits I'd miss too much when they aren't around (like yuzu, rhubarb, and strawberries), but I know I'll have fun when I see them back in the store shelves (or up on the trees). Oh, Grom! That brings back great memories. I was in Florence for a week in October 2009, with my mother and aunt, and we had gelato from Grom almost every day (and sometimes twice). I loved the Pera (like eating a frozen pear but more enjoyable), Fiordilatte and the extra-dark chocolate (even though I don't like chocolate gelato). I wish I'd been there for the Persimmon! Now I'll just have to go back. I love quince. It's been a while since I've had it. It looks delicious in your pics. Oh my goodness! 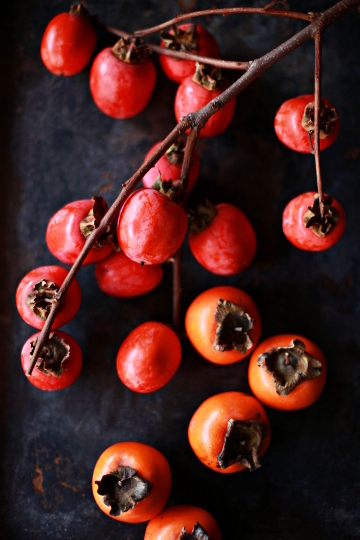 Beautiful photos...can't wait to try the persimmon recipes especially. They are overflowing in my fruit basket right now! From Tree to the Table, the photos are so beautiful and each dish looks so yummy! Wow, so many beautiful photos to take in. I've never had a quince before--how sad is that?! You make me want to try one! I really want to learn how to can things. One of the things on my bucket list! I haven't tried preserving these fruits but thanks to an aunt who gives me some of her nectarine preserves! Yummy photos! love your pictures and wanna try all these recipes u made! Amazing post. So calming and warm. Thank you. 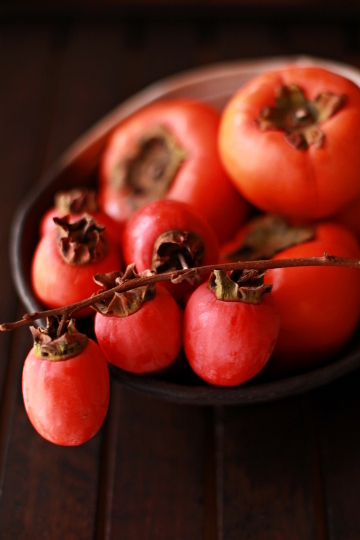 I love persimmons, crunchy or overly soft! Best eaten over the kitchen sink. :) But our family doesn't fancy this fruit much so I got to try out a few persimmon recipes inspired by your blog post (it's mid-autumn over here). I made a simple macadamia ginger and cinnamon whole wheat persimmon cake and it was good served with a scalding hot cup of tea. Thanks again for the gorgeous collection of autumn dishes.